September 13, 2018, Detroit – Many people spend months preparing for Christmas, but are you ready for Advent, the Church season that prepares the hearts of the faithful for Christmas? 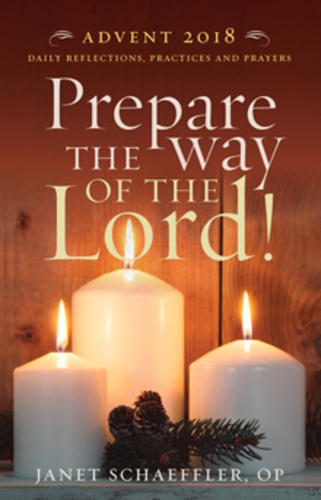 Sister Janet Schaeffler, OP, writer and speaker on adult faith formation, has written and published a 2018 Advent booklet, Prepare the Way of the Lord, through The Pastoral Center. The booklet includes a reflection for each day’s Scripture readings, as well as a suggested daily action and a brief prayer. A retreat leader and a consultant for catechists and adult faith formation leaders, Sister Janet also once ministered as Director of Adult Faith Formation for the Archdiocese of Detroit. She is a recipient of the National Conference for Catechetical Leadership (NCCL) Distinguished Service Award. Prepare the Way of the Lord can be ordered through The Pastoral Center via the link provided above or through the Weber Shop at Weber Retreat and Conference Center, 517-266-4035 or webershop@adriandominicans.org.